Nothing Outperforms FORTA® Asphalt Fibers. FORTA-FI® is a high tensile strength synthetic fiber blend formulated to reinforce asphalt mixes in both new construction or rehab projects. 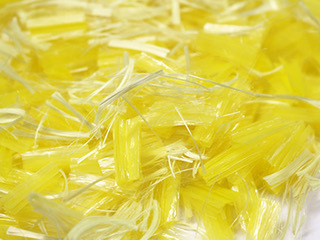 The mix of aramid and polyolefin fibers is designed to enhance your current mix design. Aramid fibers will not melt in the asphalt mix and are known for their strength and durability in both high and low temperatures. FORTA-FI can provide initial cost savings through reduced pavement layer thickness while delivering the same durability as conventional mixes OR the ability to reduce the overall life-cycle costs by extending pavement life (when placed at a conventional pavement thickness). Stronger than your traditional mixture. Reduces cracking and rutting. While we have known for years that adding reinforcing fibers to asphalt would substantially increase the life of that asphalt, it was very difficult to quantify the years and calculate that value for our customers. Recent research has provided more detail about the benefits provided by FORTA-FI. Case studies developed by Arizona State University utilizing pavement design software [Mechanistic Empirical Pavement Design Guide (MEPDG)] detail the cost savings involved in reinforcing asphalt pavement using FORTA-FI. This research program also determines that the longevity increase would be 50% or more, beyond the same thickness of traditional asphalt. To manually feed fibers or to use an automated Fiber Metering Device? You decide! FORTA-FI® is easy to add to your mix no matter how you add your fibers! See how FORTA-FI® meets the challenges in various applications. See how FORTA-FI® can extend the life of asphalt. FORTA-FI® can reinforce asphalt to prevent cracking. See how FORTA-FI® performed in various trials. FORTA-FI® is uniquely capable of solving many rutting problems. FORTA-FI® is a three-dimensional reinforcement for asphalt. FORTA-FI® has been extensively tested with proven results! See how easy it is to add FORTA-FI® to your mix! See how FORTA-FI® can save you money now and down the road! See how FORTA-FI® can help strengthen America's infrastructure while lessening the tax burden. See how FORTA-FI® outperforms conventional fibers. Learn how you can save by adding FORTA-FI® to your mix! No, FORTA-FI® can be added by the bag, or through one of the various types of fiber feeders, via the RAP port, or hot bin doors in a batch plant. The fibers should be introduced before the addition of the liquid asphalt. While the fibers disperse uniformly in seconds, it’s best to allow 3 to 5 seconds of dry mixing time before addition of liquid asphalt. The use of FORTA-FI® will not require any special plant modifications. No, FORTAfied® asphalt is placed and compacted exactly as conventional asphalt pavement. FORTA-FI® is a blend of several different fibers that each play an important role in the reinforcement of asphalt. The high temperature fibers are among the strongest fibers made, and are only 1/10th the diameter of a human hair. Some fibers are designed to melt into the asphalt mixture aiding in the dispersion and adhesion of the of the high-temperature fibers while enhancing both the cold and hot properties of your asphalt design. The combination of these fibers in the recommended dosage creates significant improvement in tensile strength with over 18 million fibers per ton of asphalt mix. Research, and our many projects around the world have shown that the recommended dosage of one (1) pound bag of FORTA-FI® fibers per one (1) ton of asphalt is optimal in most circumstances. While there may be cases where different dosages may prove to be beneficial, those projects will need to be consulted and verified for each individual application. Both the asphalt savings and increased longevity were calculated utilizing performance testing results conducted by Arizona State University and the Mechanistic Empirical Pavement Design Guide (MEPDG). Can FORTA-FI be mixed in either batch or drum plants? Yes, the new packaging assures that FORTA-FI® will disperse uniformly in both batch and drum plants. How long does FORTA-FI take to mix, and will it mix at high production speeds? Provided the proper production temperatures are maintained, FORTA-FI® will disperse uniformly in seconds at all production speeds. High percentages of RAP may require longer mixing time. How can FORTA-FI save money on the initial project cost? Immediate cost savings are made possible by reduction in asphalt thicknesses up to 35%. Additional savings are realized through shorter construction schedules, fewer trucks, fewer lifts, etc. How can FORTA-FI save money over the life of the project? FORTAfied® asphalt of the same thickness and your conventional asphalt will last more than 50% longer. Longer life results in less maintenance and resurfacing over the design life of the asphalt. Is FORTA-FI only for HMA, or can I use it for WMA or Patch mixes as well? No, FORTA-FI® is typically packaged in a one (1) pound bag per one (1) ton of asphalt dosage (bag and all). While different bagged dosages are available for batch mixing if necessary, the process still requires no measuring. Are there any reference projects or case studies demonstrating the success of FORTA-FI? Results and details from our research project conducted by Arizona State University, as well as project profiles, and DOT pilot projects are available on our website and upon request. FORTA-FI® has had pilot projects in PA, NY, OH, and GA to name a few but has also been used around the world. What is the difference between reinforcing with FORTA-FI fibers and woven mats? FORTA-FI® fiber mixes three-dimensionally within the asphalt pavement. Woven mats are located underneath the base of the asphalt pavement. Because cracks can happen anywhere within the asphalt, FORTA-FI® fiberreinforcement aids in strengthening the asphalt and reducing cracking wherever it may occur. Another advantage of FORTA-FI® is it’s much easier to use. No additional construction steps equals labor savings! Can asphalt reinforced with FORTA-FI be recycled? Yes, less FORTAfied® asphalt is required per job reducing the thickness and/ or better performance and longer pavement life reducing lifecycle costs, and it can be recycled—RAP.